Originally published in Ara.Cat on September 30, 2012 Translated with permission. The European Commission confirms that "there is no law that says that Catalonia must leave the EU if it becomes independent"
The Vice president, Viviane Reding, said in an interview with the Diario de Sevilla that "it never occurred to her for a second that Catalonia would want to leave the EU". The commissioner says she has “perfect confidence in the European mentality of the Catalans”. Another important voice in Brussels recognizes that there is no legal framework that stipulates that an independent Catalonia would be forced out of the European Union. The vice president of the European Commission adds to what another commissioner and Vice President of the EC, Joaquín Almunia said some weeks ago. In an interview with the Diario de Sevilla, Reding says that she “never thought for a second that Catalonia would want to leave the EU”. “I have known the Catalans for a long time, and I am one of the few non-Catalans who has received the Saint George's Cross, and I know that are profoundly European,” she explained to the paper. Reding was clear and definitive when the journalist finished the interview by saying that the Vienna Convention says that a state that becomes independent must abandon all of the international organizations of which it previously was part. “Come on, man, the international legislation doesn't say anything of the kind about that. Please, resolve your own internal problems in Spain. I have perfect confidence in the European mentality of the Catalans,” said Reding. 1. That the Parliament of Catalonia expresses its recognition and congratulates itself for the enormous success achieved by the massive demonstration through the streets of Barcelona last September 11, under the slogan, "Catalonia, New State in Europe". 2. That the Parliament of Catalonia declares that over the last thirty years, an important majority of Catalanism has profoundly committed itself to the transformation of the Spanish State in order to fit better therein without having to renounce our legitimate national aspirations, our will for self-governance, nor our continued existence as a nation. But our attemps to fit Catalonia into the Spanish State and the latter's repeated responses are today a dead end. Catalonia must begin a new era based on the right to self-determination. 3. That for that reason the Parliament declares the need for Catalonia to forge its own path, noting the necessity of the People of Catalonia to decide on its collective future freely and democratically, in order to guarantee social progress, economic development, strengthened democracy, and the promotion of our own culture and language. 4. 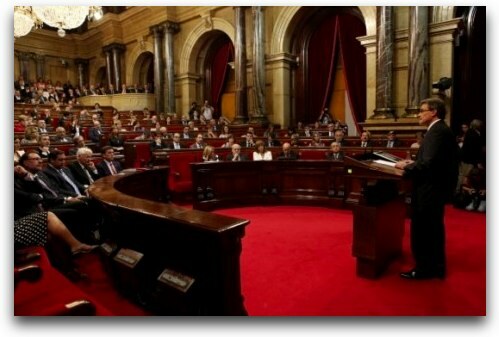 That the Parliament urges the Government of the Generalitat as well as political, economic, and social forces to come to the strongest consensus possible in order to bring this democratic process and the resulting strategic plan to fruition, while in communication with the international community, the European Union, and the Spanish Government, so that the citizenry of Catalonia can decide, with complete freedom, respect for plurality, vigorous debate, and democratic civility, and without coercion of any kind. 5. That the Parliament of Catalonia notes the need for the People of Catalonia to determine freely and democratically its collective future, and urges the government to hold a referendum at its earliest convenience during the next legislature. Each day there are more and more articles published about Catalonia. And searching for them reveals that many of these are copies, perhaps from a wire service like AP or from cooperating newspapers in different countries. Often, the headline is the only difference from one source to the next, and it is the byline, or a specific quote that really identifies the article. Nevertheless, I find it interesting that it is just a few articles (though many more than ever before) that are being picked up by so many newspapers across the globe. Again, I started this blog because I couldn't find *any* English-language news about Catalonia. Now, there is so much it's hard to keep up with. As ever, updating throughout the day. Posted 4:39pm ET. "For instance, Giner told Al Jazeera that although the Spanish constitution obliges the state to protect the Catalan language, "they don't do anything about it. It's us or nobody. We have to look after it. This is a treasure for us." "
"But what most angers people is that Catalonia is responsible for managing public services, but Madrid retains regulatory and tax-and-spend powers"
"That same poll indicates that 83% of Catalans agree with holding a referendum on independence, and 55% would vote in favor." "The situation is complicated by the fact that the Basque region of Spain has been given a great deal of autonomy in its budget. If Spain were to compromise and give Catalonia the same deal, it would cost the Spanish government a great deal of money and enlarge the already gaping hole in their budget." "An unspoken practice in Spain is that most workers get two salaries. One is the official salary, the taxable one, the other is cash in a brown envelope – the black market if you will. Many private-sector workers are paid in this two-tier manner." "It's not the cuts, per se (though they don't help, when unemployment is already where it is), it's the feeling that people have no power over government, that the government favors elites, and that the country is losing sovereignty that drive people mad." Here are a few articles from today. The Financial Times continues with excellent coverage. "With an economy the size of Portugal’s, it has acquired the heaviest debt burden of any region. Catalan officials and economists say they would be solvent if they had a similar agreement to the Basques, who transfer up to ten times less per capita to the Spanish fiscal pot than they do. Catalonia, they say, hands over to Madrid about €18bn a year, or 9 per cent of economic output – an amount that exceeds the demands of equitable transfer to poorer regions, which many federal systems cap at around half that level." "So it smells like the 1930s all over again. Except it isn’t the 1930s all over again. So put away George Orwell, Ernest Hemingway and Laurie Lee." "Catalonia secession is neither a sure thing nor an imminent one, analysts note. Catalans for centuries have been bandying about the idea of independence for their thriving bastion of manufacturing, shipping, tourism and culture." "Catalonia, the region in the north-east of Spain where the Sant Andreu graveyard deaths occurred, recently cut its disability support budget by 57%. Meanwhile, suicides in Catalonia increased by 10% in 2011 from the previous year admits the Catalan government, which reflects a nationwide trend. " Ramon Tremosa is a Member of the European Parliament for CiU. The original version of this post can be found on Mr. Tremosa's blog. It is reproduced (and translated) here with permission. September 27, 2012 will be a day to remember in the history of Catalonia because 84 Members of Parliament, with the President of the Generalitat as their leader, voted in favor of exercising their right to self-determination in the next legislature. Only 21 voted against. This vote, approved by almost 2/3 of the members (CiU, ICV, ERC, SI, Maragall i Laporta) and with the abstention of 26 representatives of the Socialist Party of Catalonia, was the culmination of two exciting September weeks, that began with a massive demonstration and led to today. On the international scene, and especially in Europe, the media has given quite a different portrait of the events going on in Catalonia than has the press in Madrid, describing the early elections of November 25 as a "de facto referendum on independence" (Financial Times). Spain's loss of prestige thanks to the incompetence and arrogance of its governments, including the total financial bailout that Madrid to this day is refusing to ask for out of some sense of pride, generates shock and amazement in EU institutions and threatens to drag the euro farther down into the pits. In this context, the path that Catalonia started out on today with early elections has as an objective to build strong majority support for sovereignty around the right to self-determination, with a broad majority of the homegrown Catalan parties which have no ties to central parties, which would be basically unanswerable in the context of a democratic Europe. The unionist parties would be well advised to present the benefits of the union (if there still are any) instead of hurling threats or manipulating reality. President Mas has grasped that in Catalonia there is already a majority in favor of a break-up, in great measure led by orderly people (as Josep Ramoneda has described, it's a break-up, not a revolt or revolution). Europe is already asking what the Catalan parties, especially CiU, plan to put in their electoral platforms, despite the fact that President Mas has been particularly clear during these historic days of debates. 1. September 25, 2012 will be remembered in Catalan history books because President Artur Mas called for early elections in the Parliament, saying "the moment has come for Catalonia to exercise its right to self-determination in the next legislature". On September 26, 2012, President Artur Mas said, also in the same Parliament, that the "referendum will be held even if it violated Spanish law" denying almost simultaneously what Duran Lleida was saying on a state radio show. 2. All of these things were said and done in Parliament: the European institutions have told me that we can organize the best civic and peaceful demonstrations in the world for the most noble of causes, as is the freedom of Catalonia, but what the EU is waiting for are "votes and acts of Parliament". In fact, the "Catalan dossier" will only be opened in European institutions from the moment the Parliament of Catalonia votes as it did last July, in which a proposal for the economic financing plan which demanded fiscal sovereignty (which is 2/3 of a country's total sovereignty) received 82 votes in favor and only 23 against. 3. In fact, in Brussels, they'e not asking "What are you Catalans doing?" but rather "When are you going to do it?" Since the outdated, politicized and discredited Spanish Constitutional Court amputated a Statute that had been voted on favorably by the people, and by both the Spanish and Catalan parliaments, many European MPs and high-level civil servants of the European Commission have seen that the Spanish Democracy doesn't even reach the level of "budget democracy". In this sense, the answer from Mas to Rajoy (who had said, "Take your fiscal pact to Congress and see how many votes it gets") that he relayed in the Parliament was one of great dignity: "Now it won't be the Spanish Congress who votes (as they did on the Ibarretxe Plan), but it will be the Catalan people who vote." 4. The most insistent question, however, that I get is "What will Ciu put in its platform for the upcoming elections?" The electoral platform is seen in most democratic countries like a sacred compact that must be fulfilled no matter what: this is what provides a "democratic mandate" like the one that makes the British government accept the Scottish Referendum. I answer that if CDC aims to be a serious and respected party in the European context, it must be predictable, consistent, and coherent, just as the Northern European parties are. That means the platform has to include the phrase "sovereign state", just as it was agreed in March of this year in its last congress in Reus. Further, I also have to explain what I hear Josep Rull repeating in every interview I have heard him give lately: "if the State bars Catalonia's way again, the only option left will be a unilateral declaration of sovereignty by the Catalan Parliament", the thought of which terrifies the Spanish, given the precedent created by Kosovo. 5. In the EU, I haven't seen anyone question the SNP's democratic mandate, since they won the elections with such a proposal in their platform and thus are now required to hold a referendum. On the same principle, Daniel Cohn-Bendit, the leader of the European Greens, told La Vanguardia on September 26 that the EU would accept Catalonia's independence if it was passed by a clear majority after following scrupulously transparent and democatic procedures. Amen. Originally published on September 27, 2012 in Vilaweb. The political events happening in Catalonia are being closely followed by international news organizations and also by governments from all over the world. This was clearly demonstrated during the General Policy Debate this week in the Catalan Parliament, where there were more accredited international media than ever before, as well as the presence of representatives from certain countries during President Artur Mas' Opening remarks on Tuesday. To wit, from within the gallery of the Catalan Parliament itself, Mas' speech was listened to by the General Consul of Germany in Barcelona, Bernhard Brasack, and by an assistant to the US Consulate in Barcelona. There was also a Member of the Quebec Assembly, Alain Therrien, in the role of parliamentary advisor to the Quebec's Minister of International Relations. With respect to international news media who requested accreditation for their professionals in order to attend the general policy debate, the Parliament's Press Office mentioned Al Jazeera, France Press, Associated Press, Reuters, the newspapers La Presse from Quebec, Volkskrant from the Netherlands, Sud Ouest, Proceso from Mexico, the French radio station Europe 1, the Getty Images agency, Deutsche Welle, The Times, and the Wall Street Journal. Again, I will post news articles about Catalonia here throughout the day. Come back later for updates! "That's when most of the Camp Nou crowd started singing - for Catalan independence from Spain. I've watched over 200 Barca games at Camp Nou and have never witnessed anything like it." "Mas asked Spain's biggest political forces, all of which have rejected Catalonia's independence drive, to respect the region's aspirations if his party wins the regional elections. "I ask that you listen to the people. If the verdict of elections is clear, accept it."" "Q. Could Catalonia make it as an independent state? A. Yes, but it would not be plain sailing. Catalans have a highly developed sense of national identity. Even many second-generation Catalans – children of Spanish speakers who moved to Catalonia from other parts of Spain from the 1960s onwards – are attracted by the prospect of independence." "And Catalans by and large do not like being a part of Spain. A recent Roubini Global Economics client briefing highlights just how bad sentiment there was last time a referendum on the issue was taken"
"The government faces an even graver domestic challenge, however, from developments in Catalonia, where a growing separatist mood threatens Spain’s unity." "Mas has vowed to offer the Catalan people a voice on independence "with or without" the authorisation of the Spanish government. " ""If Catalonia had a Basque tax regime, it would have Basque's finances, it says," Nixon wrote in a client note. "Instead of having to go cap-in-hand to Madrid for help with its debts and payroll - to be rescued, in effect, with what it regards as its own money"." As ever, this is hardly unbiased. 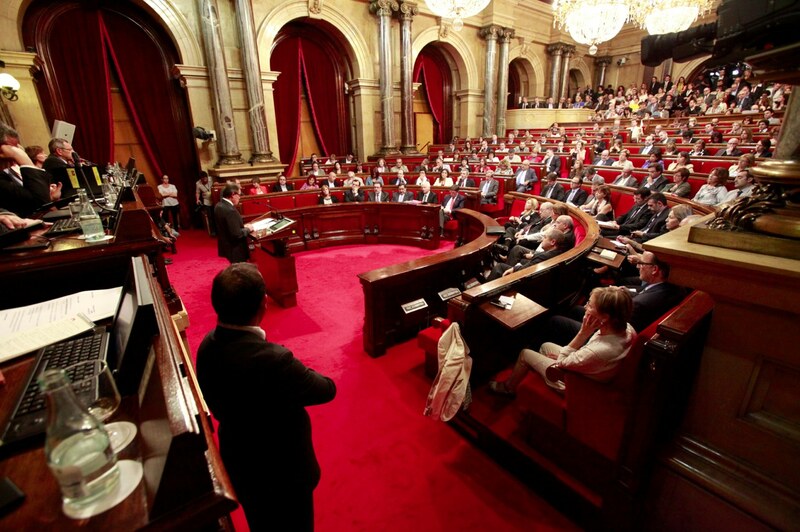 But it'll situate you during the General Policy Debate taking place today through Thursday in the Catalan Parliament. Catalan politics is complicated by the fact that the left gets divided between ambiguously-catalanist (PSC, ICV, EUiA) and explicitly-Catalanist positions (ERC, SI), while the right mostly is controlled by Catalanist-talking (and-currently-acting?) CiU, which sometimes aligns with strongly-centralist PPC. In order of representation. Suggestions and comments mostly welcome, in moderation. CiU (Convergència i Unió/Convergence and Union). 62 seats (2010). A coalition of CDC (Convergència Democràtica de Catalunya/Catalan Democratic Convergence) and UDC (Unió Democràtica de Catalunya/Catalan Democratic Union), they support what we Americans consider conservative fiscal policies. I've never been really clear by what they mean by "convergence" but they have been the main "Catalan nationalist" party in power since the Transition. 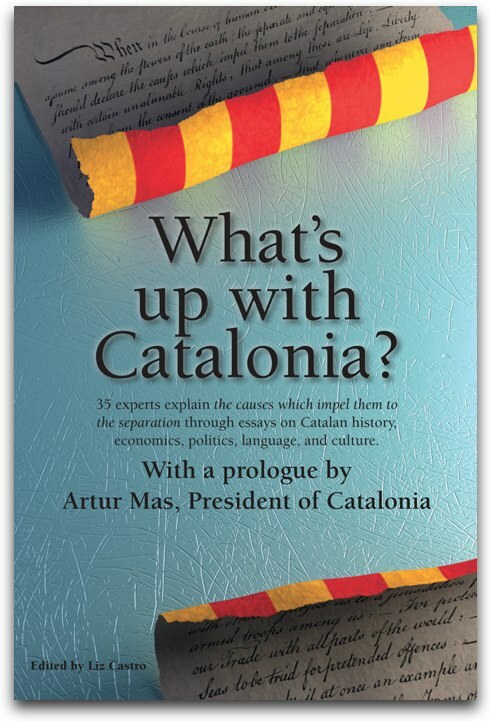 I put "Catalan nationalist" in quotes because up until September 11, 2012, they espoused Catalan language, literature, and some autonomy, but not independence. They continue to be reluctant to use the word "independence", opting instead for "estat propi" which doesn't have a direct translation into English, something like "one's own state". This dialectal ambiguity makes many Catalans wonder if they really mean independence (e.g., secession from Spain) or if they would agree to be a state more like Massachusetts (hardly independent from the US) or Bavaria (ditto with Germany). PSC (Partit Socialista de Catalunya/Socialists' Party of Catalonia). 28 seats (2010). Basically a subsidiary (!) of the Spanish Socialist Party, which might sound scary to Americans, but is pretty much aligned with American Democrats, perhaps slightly left of center. Their alliance with the Spanish PSOE means they tend not to be Catalanist, though there seems to be increasing tension within the party on this score. PPC (Partit Popular de Catalunya/People's Party of Catalonia). 18 seats (2010). A subsidiary of Spain's PP (People's Party), which grew out of the Alianza Popular, founded by former Franco minister Manuel Fraga. They are both rightist and centralist. Major players: Alícia Camacho Sánchez (President), Jordi Cornet (Secretari General). ICV-EUiA (Iniciativa/Initiative for Catalonia Greens) & (Esquerra Unida i Alternativa/United and Alternative Left). 10 seats (2010). Very broadly, without going into centuries of Spanish and Catalan history, this coalition is a loose and perhaps modernized descendant of the Catalan Communist party (PSUC). They tend slightly farther left than PSC, but espouse an "international" mindset that while not anti-Catalan, often relegates Catalan interests to a second level. In my mind, they have been closely aligned with the #15M movement (the inspiration from Spain for the Occupy movement) and also support ecology related issues. ERC (Esquerra Republicana de Catalunya/Republican Left of Catalonia). 10 seats (2010). Esquerra is the party with the most independentist history, as it is the party of Francesc Macià (who declared an independent Catalan Republic in 1931), and Lluís Companys, Catalan president who was executed by Franco's troops. Presently, its politics are slightly left of center with a special emphasis on Catalan interests and independence. SI (Solidaritat Catalana per la Independència/Catalan Solidarity for Independence). New party formed before 2010 elections, purely independentist, Catalanist, left of center. C's (Ciudadanos/Party of the Citizenry). 3 seats. Centralist, anti-catalanist. I will be updating this list throughout the day. "Rajoy says Mas’s proposal to keep more of its tax revenue would violate the constitution. The document, which dates back to Spain’s transition from dictatorship to democracy in 1978, can’t be changed, Rajoy says. The constitution was amended last year for the second time when the two biggest parties agreed to add a clause on budget discipline." "“The voice of the street needs to be moved to the ballot boxes,” the president of Catalonia, Artur Mas, told lawmakers at the regional Parliament. “We want to have the same instruments that other nations have in order to develop their own collective identity.”"
“The hour has come to exercise our right to self rule,” said Artur Mas, Catalonia’s president. He called the vote, which is likely to be cast as a proxy referendum on Catalan independence, after Mr Rajoy last week rejected his demands for greater fiscal autonomy, triggering a wave of nationalist sentiment in the northern region." "The sharing of sacrifices between the state and the regions is very unfair," Mas said. "The result is that the biggest cuts have to be made in health and education, which are the main responsibilities of the regions." CNBC: Catalonia: The Next Independent State in Europe? "This week, the Catalan parliament is set to approve a resolution that would create a referendum on independence. Eighty-three of the 135 deputies in the regional parliament support independence." "There are times when the PP seems the best ally of its worst enemies. " "Madrid faces a backlash from its own conservative supporters over attempts to calm separatist tensions in Catalonia, hampering efforts by Mariano Rajoy, the prime minister, to avoid a constitutional crisis." "Be that as it may, what we have in Spain is a disturbing turn of events." I posted the transcript (in both English and Catalan) of President Mas' Press Conference after his meeting with President Rajoy yesterday. Today, I offer you the transcript of the Question and Answer session that followed his presentation, in both its original Catalan and Spanish (at the end), and my translation into English. Please spread this far and wide. As gratified I am that international news sources are finally covering what's going on in Catalonia, I still think it's crucial to hear exactly what is being said. To that end, my translations of political speech will continue to be as literal as possible. Once again, my thanks to the Catalan Government Press Office for providing me with a copy of the original transcript. Q: I seemed to understand that you are sorry that the meeting didn't go well because it affects the common future and you made a reference that you maintain the fiscal goals. Do you think following the path toward fiscal sovereignty is compatible with a future within Spain? President Mas: I will repeat what I think I said, I think that it's not exactly the way you interpreted it. Not just I, but a very significant portion of the Catalan population, believed that the fiscal pact would be a big improvement for Catalonia, a leap forward for self-governance, and a possible reduction in our fiscal deficit, and at the same time, together with all of that, a possibility of reaching an agreement with the state, and thus, within the framework of the state, even within the Constitution itself, and the rules in place, that a fiscal pact could have been created that gave Catalonia a unique fiscal situation, in line with fiscal sovereignty, that would allow us to collect taxes, give us the key to the strongbox, that would transfer the state tributary agency to Catalonia, as is done with other agencies; that the Catalan Parliament could control the level of taxes much more than it can presently, that this fiscal pact would open doors that over time would significantly reduce our fiscal deficit with the rest of the Spanish state. Not at this moment when there's no money, there's only debt, but at the moment when the economy begins to improve. That is what the Catalan Parliament voted in July. That is what will not happen. And if that cannot happen, Catalonia cannot give up on its ideas for the future, it cannot give up simply because it is impossible to negotiate with the Spanish Government, it can't give up on building its future, and it cannot give up its wish of self-government; it cannot, it would be a self-immolation of Catalonia, and even a betrayal of the people of Catalonia if the Catalan people are willing to go down this path to build its self-government. And that definitely does enter into the debate on sovereignty. What I told you before is that this very important debate should take place next week and over the next few weeks, it's not a debate that should be rushed, that must be undertaken today, each moment has its own codes of conduct. Today we are at a "no", there is no room for discussion of the fiscal pact and next week we will be in the Catalan General Policy Debate and making decisions. And in the next few weeks we will see where these decisions will take us. Q: Is an immediate call for early elections on the table, among the decisions you will make next week? And what is the message that you will bring to those elections? Will you bring a message of independence? How can you do that with the current Constitution? Let me tell you two things, one I've already mentioned and that I'll repeat. There are questions which don't have an answer today. I'm not going to answer you today about whether there will soon be elections in Catalonia or not. These decisions and many others must be made in the next few days or weeks. Today is not the moment for announcing them because, for one thing, they have not been made yet. Don't speculate so much. There are decisions that are mine to make alone, in my capacities as Catalan President, and I can assure you that right now, I have not made any, everything is still on the table. I want to appear before the Parliament next week and within the solemnity of the General Policy Debate be able to have a thorough debate on the situation in which we find ourselves as a country, as Catalonia. The topic of whether the Constitution is a framework in which we can move forward or not, we always had believed it was. I believe that Spain is committing a mistake and that the Constitution is almost always reinterpreted with a centralist slant, and that is a grave error, since the Constitution was created in 1978, three years after Franco's death. [Catalan] President Taradellas had just returned to Catalonia and three years later, in 1981, there was sable rattling and the Guardia Civil's invasion of Congress. The Constitution was created in that context, but in such a way that it could be reinterpreted, so that in better times, and with less noise, things could be done that were not possible in the 70s. But thirty years have gone by and instead of re-reading the Constitution in a more open, more friendly way in line with a pluri-national State, which the Spanish one definitely is, because there are peoples here who feel like a nation and that can't be changed with a Constitution, or with declarations from the highest ranks. You can't change that, it's a feeling, a will, a project with a history, an identity, it's all that together, and that can't be changed by a Constitution, by declarations, by applying pressure, or by making people afraid. Not even dictators have been able to change that feeling, go figure how other situations might affect it. They don't ever want to read the Constitution in a more open way than they could have 35 years ago? Constitutions adapt and even if they don't, they still don't overrule the will of the people, and if Catalonia at a given time, perhaps in the next months or years, in a peaceful, democratic way with the support of the majority, wants to envision a path and a project for the future, well, the Constitution can't simply be positioned as an unsurmountable obstacle. It doesn't work like that anywhere. "But thirty years have gone by and instead of re-reading the Constitution in a more open, more friendly way in line with a pluri-national State, which the Spanish one definitely is, because there are peoples here who feel like a nation and that can't be changed with a Constitution, or with declarations from the highest ranks. You can't change that, it's a feeling, a will, a project with a history, an identity, it's all that together, and that can't be changed by a Constitution, by declarations, by applying pressure, or by making people afraid. Not even dictators have been able to change that feeling, go figure how other situations might affect it." Q: Did you leave Moncloa [President Rajoy's Office] with the feeling that the legislative session was over and do you think that, besides in the Parliament, the people should be given the chance to voice their opinion, via elections or a referendum? It's obvious that once you get to the conclusion that the fiscal pact has no possibilities for negotiation, which is what was said to me very clearly, it's obvious that this is a significant turning point in the legislative session, the opposite cannot be said, that would be going against common sense. This was the principal matter to be discussed, together with restarting the economy and protecting the welfare of the people. The fiscal pact, which in addition, is tied to the two other topics, has no way forward. Let me make it clear, it was not my intention today that they would say yes to everything I asked. What I wanted today was to see if there was any room to move forward or to discuss it. But there's not, there is no possibility, and it's obvious that this is a crucial turning point in this legislative session. How can it be resolved? I ask you not to speculate because you may well be wrong. You could certainly speculate a lot, but I think it's more normal, more correct in a mature democracy that Catalonia tries to be, that if we have a crucial turning point in a legislative session, and in three days we have scheduled a General Policy Debate, which is the most serious one of the year, the most normal option is to have that debate in the Catalan Parliament. And that's what we will do. Q: You said that besides the definitive No to the fiscal pact, in the meeting, you also discussed the possibility of revising the system for financing the autonomous communities in 2013. I would like to ask you if that was offered on the side, as an ellipsis, in small print, or with more formality. How important was it? And secondly, I wanted to ask if you offered any opinion to the Spanish President about the King's letter. I can't give you an idea of the size of the offer of revising the financing system because while today Mr. Rajoy was in a position of saying 'no' to what I suggested, without any gray areas, he also said: this is 'no' but we should discuss the other matters at some point. But revising the financing system next year will have to be discussed, because according to the law, the old system expires after five years. Therefore, no matter what, it will have to be discussed. I think that at this point, I have the feeling that they don't have anything figured out yet. I think that it's more a general offer and one in the traditional line of that every year that the financing system must be revised, all of the autonomous communities of the common system get together, there are 15 of us, and we talk it over with the Government and from there, we more or less adapt the old system and some more things, which sometimes is positive, and sometimes not so much. This is the Autonomous Community financing system movie we've been watching for the last 30 years. We in Catalonia were hoping to move beyond that. And they offered us the same old, same old. For that reason, at the beginning, I told you that when they offered us the same old thing, we, as civilized people, will go to the bargaining table, we will listen, but we know that that does not solve Catalonia's problems, and that's that. It does not change anything substantial or fundamental, which is what we intended, and what we intend in Catalonia. The King's letter didn't come up in the conversation. We didn't spend 30 seconds on it. Q: Have you calculated the financial consequences of your discourse? You have recognized that the markets and European partners are keeping a close watch on the Spanish situation. Have you taken that all into account? Secondly, how do you see the King's letter? How can progress be made toward more sovereignty for Catalonia within the confines of the Constitution? If there is not a more open reading of the Constitution, it's obvious that within the confines of the Constitution, you have to read it in the sense that we propose. For example. I am of the belief that what we have proposed for the fiscal pact does not require a change in the Constitution but rather of the LOFCA law, which is a law that derives from the Constitution but can be made in one way or another. In no section of the Constitution does it say that Catalonia can't have a bilateral financing system with the State. What it does say is that autonomous financing systems must incorporate a quota of 'solidarity' with the other territories. But that the Catalan Government cannot manage its own Tributary Agency the way it manages the police, that is not in the Constitution. What is more, in one article, it says that almost everything is transferable to the autonomous communities, if desired, and thus so is a Tributary Agency. You can't make the Constitution into an unsurmountable obstacle, it makes for an impossible future. And if you can't change anything, or reinterpret anything, in the end it becomes impossible to move forward. For some, for other parts of the State it won't be like this, but for a territory like Catalonia, that has real aspirations of self-government, and that in addition, considers and feels itself to be a nation, this feeling, will, project and hope cannot be canceled out by a constitutional text. "But, should the fact that Spain is in the situation in which it finds itself, and that affects all of us, mean we turn our backs on Catalan public opinion, in which a million and a half people come out and demonstrate in a perfectly peaceful way, without breaking anything?" I have taken the current situation in which we find ourselves into account perfectly. So much so that I believe we are acting with complete serenity. But, should the fact that Spain is in the situation in which it finds itself, and that affects all of us, mean we turn our backs on Catalan public opinion, in which a million and a half people come out and demonstrate in a perfectly peaceful way, without breaking anything? Is this a reality that we should just forget and turn our backs on? Imagine if in Spain there was suddenly a demonstration with 9 million people, that is the same proportion as the million and half we had in Catalonia. Can you imagine that you could turn your back on a demonstration of 9 million people? Well we can't turn our backs on them either because we are the Government of Catalonia and we know that from this day forward, in addition, our project of negotiating a fiscal pact can move no further ahead. They told us so quite clearly. Of course there's instability, there is instability all over Europe, but just because there is instability we cannot simply hide our heads and pretend we don't exist. The situation is wide open, and sovereignty debates in the midst of complete instability are happening all over Europe. Or is it not a debate on sovereignty whether the ECB should create a bank that controls the entire European financial system? And if in the end, some take advantage of one fund and others of another, there are also problems of sovereignty and that is no reason to make hasty decisions. There are constantly problems of sovereignty being debated all over Europe. If there weren't sovereignty debates, we would have the United States of Europe already, which is what we need. Everyone knows it. But it's precisely because we have sovereignty debates that we don't have the United States of Europe. And Catalonia in this situation cannot be silenced nor subjugated nor inert. It must be alive, and it will be so. My opinion on the King's letter was expressed by our government spokesperson a few days ago. We don't think it pertains to us. If he's talking about pipe dreams, it could also be considered a pipe dream that, without touching the Constitution or ever re-interpreting it in any way, there is any hope of fitting Catalonia into the rest of the State. And I don't say that as a reply to the King's letter, because we don't think it's about us. We have not proposed any pipe dreams, we have proposed a project called the fiscal pact, and it was approved by 70& of the Parliament, and we have defended it where necessary. It is a project widely backed by Catalan society, voters from all parties believe in it. That cannot be considered a pipe dream, the way we see it, the King cannot allude to it as a pipe dream, and thus we feel he cannot be talking about us. Q: With respect to the calm and constructive debate that you are asking be held within the General Policy Debate, you said last week that a definitive No from Spain or the state to the fiscal pact would open the door to freedom for Catalonia. I would like to know if you plan to position the debate in this direction, since today you haven't even mentioned the "state structures" that you talked about the other day. No, today I did not. Not because I mean to contradict myself. I did it for a very simple reason that I think you all have already understood. Today I didn't come to give my response on what we will do in Catalonia. Today I came to explain the importance, what it means that the fiscal pact cannot move forward, once that is clear and officially communicated, and that is no minor matter. What I have to say in that sense I will say next week in the Parliament and in the next few weeks in general. I think that makes it clear, it's not what you wanted to hear, but it is the limit to what I will say that I have self-imposed out of respect for the Parliament. The Parliament chose me as President, and if we were four months away from the General Policy Debate, maybe I would do it differently, but since it's three days away, I believe I need to go to the Catalan Parliament and explain things just as I see them, as the Government sees them, and from there, listen to the parties and make decisions. Q: In this process of reflection that begins now, are you planning on meeting with Catalan business leaders who have asked that you try everything possible to move the fiscal pact forward? "For me, today is not a day in which I feel happy or satisfied, because I know that all of this adds many kinds of problems, but I am also very sure about what I represent, and it's not a party right now, but rather a people, the people of Catalonia, and I am sure that the people of Catalonia, when faced with this evidence, this negative evidence, will know how to find the answers that convert this disappointment, that today may be a disappointment, into hope and a commitment for the future." I have listened to everyone in Catalonia who asked me to bring the fiscal pact as far as possible. Afterward, I paid attention to the mandate from the Catalan Parliament and of our own platform with which we won the elections, which included the fiscal pact. The fact that I listened to them is shown out by how I got to the very end. Today I found myself in front of a brick wall on this topic, on others, not so much. President Rajoy was more disposed to talk about other matters, to find solutions, but on this matter, the answer was clear. Therefore, for all those who asked me to do everything in my power for the fiscal pact, it's done. There is no one higher up than the President of the Spanish Government, I have no recourse to any other body. And since there's no one higher up, and he tells me what he has told me, and in addition, the Spanish political parties at his side would give me the same answer, well, we're not going to waste months or years on something that we already know has no prospects for the future. Therefore, it's obvious that, from here on out, we have to make some decisions. But I want to make it very clear to all of the people who asked us to make the maximum effort on this path, that we tried until the last second of the last minute, but the answer is what it is. What I can't do is take Mr. Rajoy's place, in the sense that I would have liked the answer to be different. For me, today is not a day in which I feel happy or satisfied, because I know that all of this adds many kinds of problems, but I am also very sure about what I represent, and it's not a party right now, but rather a people, the people of Catalonia, and I am sure that the people of Catalonia, when faced with this evidence, this negative evidence, will know how to find the answers that convert this disappointment, that today may be a disappointment, into hope and a commitment for the future. Q: Did the President of the Government say if his definitive No was agreed upon with Rubalcaba? He did not say, and I didn't ask him. I understood it that way, and in addition, if you listen to Rubalcaba's statements, it's clear that the answer from the Socialist Party is also "no", no matter what the Catalan Socialists may say. The response from Spanish Socialism is "no", with the same intensity with which the PP or the President of the Government has answered. Q: Do you believe that this definitive "no" will dampen or encourage this wave of independence by the Catalan population? It's not an exact science. My intuition is that, if all the people in Catalonia who are trying to find arguments that support whether there is a way to progress within a state or constitutional framework see that there is not, and not because of a lack of will to negotiate on our part, which exists, but because on the other side of the table there is neither the will nor the interest in opening a negotiation, well, these people in Catalonia who are betting on finding arguments, well, I don't know what conclusion they'll end up with, but they will get to this: that Catalonia, as a result of these "no"s cannot be left with no project at all. That is for sure. And therefore, Catalonia, in the short term will have to formulate a project with the most ample majority possible, but it must formulate a project. Because the evidence shows that it's practically impossible to progress within the state framework, in accordance with Catalan aspirations. We had the Statute of 2006, which ended up whittled down and vilified by the Constitutional Court. That was not a neutral act, and it left in Catalonia a feeling of lack of understanding, and frustration, surely anger as well. And that feeling remains, but now it's larger. And any attempt that Catalonia tries to make about important matters that it is concerned about, in the end go nowhere, not even to negotiation, and that might make even people who up to now were reluctant change their mind and say, "the only thing that I can't permit as a Catalan citizen, whether I think this way or that way, is that Catalonia ends up without a plan, because having no plan means having no future, to be adrift, directionless. That is the only thing that we cannot allow." Q: Will you try to keep the bridges open within the Spanish state or with the Spanish state? You have been insistent that you would not make any rash decisions but I suppose there's a range within which you move and I would like to know if the bet on a break with Spain goes beyond that range. "no matter what decision we make, we are going to make it within a European framework, and within the framework of a currency in which we believe, the euro. We will not separate from that"
No matter what decision we take over the next few days, weeks, or months, I believe you can't think about it in terms of a "break", because a break would mean total isolation, and no matter what decision we make, we are going to make it within a European framework, and within the framework of a currency in which we believe, the euro. We will not separate from that. And within that European framework and the Euro is all of Spain, and also Catalonia. And no matter what Catalonia does, it will continue to be there. And that's not a break, but an evolution, at any rate. Things, societies evolve, and even state structures evolve. Just by looking at a map of Europe you can see that that's the way it's been over the last 15 or 20 years. The map of Europe of today doesn't look anything like that of a European map of 1190. And that hasn't meant break-ups, on the contrary. In many cases, it has meant there have been integrations, extensions, always with dialogue, and with a spirit of finding the best for everyone, etc. I don't know what decision will be made about it all, even by Catalan society and the Catalan political parties, but as a general reference, at least in Catalonia, I will explain it this way, I believe that one must not talk in terms of complete break-ups, because I believe that would be an error, because within the European framework, there are no total break-ups, there can't be, they wouldn't make sense. Q: Have you thought about the creation of a new State? Did he ask you for an explanation about what you were asking for? He did not. The truth is he told me straight out, "I'm not going to ask you what you plan to do because it's not my place to do so" and he's quite right. It's one thing that he cannot ask of me. Therefore, he acted properly in that sense, saying that it was not up to him what we were going to do, or about the decisions we would make. As president of the Spanish Government, it makes sense that he ask that since we are in very complicated place with the rest of the State, and that we should all try to help calm and normalize the State's situation. That is what is up to him as President of the Government. We, in these last months, while he has been in office, on many occasions have had this mentality, and with the previous government as well. We have had this mentality more than the state parties in opposition, who only think about changing the Spanish government. I didn't tell him that, but I tell you all now. Q: You said that you were not thinking in terms of break-up and that you didn't plan on separating from the EU. Could you be more specific about whether you plan to separate from Spain? I know that the debate is about breaking-up, about separation and this is the regular debate, but please understand that I must use slightly different terminology. Whatever decision Catalonia makes in the coming days, weeks, and months, whatever decision must be within the framework that we are a country and a society that wants to be part of Europe and part of the euro. From there, what that means in terms of our relationship with Spain will be seen. That's what is wide open and that I'm not going to talk about today. In whichever case, whatever decision that is made, whatever the Catalan project will be, I will defend that it should be a European project, part of the European Union, and the Euro. Q: Did the President of the Government ask you not to convoke elections? Are you planning on not breaking with Europe but yes with Spain? Do you see the two options as compatible? "If it turns out that whatever we suggest receives a 'no, no, no" then things will shift, that's for sure." Is that what you got from what I said? You're insisting on "break-up". You ask me about breaking and I tell you that's not in my vocabulary and you keep saying it. That makes it pretty hard to understand each other because no matter what I respond to you, you're going to say "break-up". It makes it very hard to answer. What can I tell you? We don't want... When we are talking about future projects for Catalonia, we don't talk about break-ups; we sometimes talk about state structures, sometimes about our own state, but we don't talk about complete break-ups. Is that part of any conversation if we start rethinking everything? Well, obviously, but that is no slight thing, it is a matter of very great magnitude. But when we do that, and we explain it, it will be within a European framework, always. We haven't gone crazy. That we want to be Catalan and also part of the future does not mean that we've gone crazy, and therefore, our natural framework is the EU and the euro. And we want to continue there. And therefore, the decisions that we make must be within this framework. And does that mean that nothing can shift in the future? If it turns out that whatever we suggest receives a 'no, no, no" then things will shift, that's for sure. It's certain that after the contemplation that will take place in Catalonia, a project will emerge that is different from that which we had up until now, that's obvious. We can't keep going many more years like the last 30 because that would be like bashing our head against the wall. That just cannot be, and that's understood, no? Now, whatever proposal that we don't frame in terms of break-up in which Catalonia evolves into something different than that which it has been up to now must be in terms of a European framework and that framework of the euro, and therefore, in a normal, calm, democratic, and of course, peaceful scenario. He did not propose that about the elections in those terms at all. He was very respectful about that, as he should be, and I told him that this put us in a complicated position and that we would have to make decisions soon. He explicitly told me that he was not going to ask me which decisions, because it wasn't his place to do so. Q: With respect to this new era that you are depicting of the relationship between Catalonia and Spain, is it possible that the steps to be taken violate the current judicial and political framework, for example, a unilaterally created treasury agency? Do you believe that we should be prepared in your opinion for steps that might violate the legal order? "there is no legal framework that can be used to eternally cancel out the majority, democratic, and peaceful will of a people." My thoughts might take a slightly different tack, because today I cannot answer the exact question you are asking. This will be seen when there are proposals for the future, arrived at by the largest consensus possible within Catalan society. The only thing that I can tell you is that there is no legal framework that can be used to eternally cancel out the majority, democratic, and peaceful will of a people. Obviously, under a dictatorship or semi-dictatorship or some other kind of regime, the will of the people can be abrogated in many ways: military manipulation through the power of weapons, violence, or the annihilation of an identity. We Catalans have already experienced that first hand, not once, but once, twice, three times, many times... We know what that means. But now Spain is not a dictatorship, and it's not a state where violence rules, it is a state where the law rules, where the rule of law is supreme, it's part of the euro, and in those conditions, if the people of Catalonia, in a majority, peaceful, and democratic manner, decide to evolve toward a different future, a time will come when no text will be able to be presented that can cancel out our feelings, our will, and our project for the future. That cannot be expressed in a legal document. You'd have to do it some other way, but in a democratic Spain, that is not possible, and in a European Spain, it's not either. This is the greatness of democracy, that you can talk about anything and you can propose anything without fear of reprisal and it is for that that we all have worked so that Spain would also be a democracy, and that's what it is. Look what's happening in the United Kingdom, where they are giving a grand lesson on what is democracy. The Scots say they want to hold a referendum and I don't know if holding a referendum is within the British rule of law, but the British Government says that if it wants to hold a referendum to decide its future, we have to negotiate some conditions. That's what you do in a democracy. I have to pressupose that if Spain is a democracy—as it is, and we have all contributed to it being so—the norm, the law—no matter how important it is—cannot always be an obstacle that cancels out the feeling, the will, and the projects for the future. That is impossible. And with that, I have not responded directly, but it's understood what we mean with that. P.- M’ha semblat entendre que li sabia greu que la reunió no anés bé perquè afectava el futur comú i ha fet una referència que es manté l’objectiu fiscal. Considera compatible seguir el camí cap a la sobirania fiscal dins d’un futur amb Espanya? Repeteixo el que crec que he dit, crec que no és exactament el que vostè interpreta. El pacte fiscal, no jo, sinó una part molt significativa de la societat catalana, havia entès que era una gran millora per a Catalunya, un salt per a l’autogovern, una possible reducció dels nostres dèficits fiscals i al mateix temps, junt amb això, una possibilitat de fer-ho d’acord amb l’Estat, i per tant dintre del marc de l’Estat, de la mateixa Constitució fins i tot, de les normes que regeixen, es podia fer un pacte fiscal que a Catalunya li donés una singularitat fiscal, en la línia de la sobirania fiscal, que ens permetés recaptar els impostos, la clau de la caixa, que se’ns transferís l’agència tributària estatal a Catalunya, com es fan altres transferències; que el Parlament de Catalunya pogués modificar a l’alça i a la baixa els impostos molt més del que ho pot fer en aquest moment, que aquest pacte fiscal ens portés amb el pas del temps a reduir significativament el nostre dèficit fiscal amb el conjunt de l’Estat espanyol. No en aquest moment en què no hi ha diners, només hi ha deutes, però sí en el moment en què l’economia anés millorant. Això és el que el Parlament de Catalunya va votar al mes de juliol. Això és el que no pot ser. I si això no pot ser, Catalunya no pot renunciar als seus escenaris de futur; no pot renunciar simplement perquè no es pugui negociar amb el Govern espanyol, no pot renunciar a construir el seu futur, i no pot renunciar d’acord amb la seva voluntat d’autogovern; no pot, seria una espècie d’immolació de Catalunya, o fins i tot de traïció al poble de Catalunya si realment el poble català està disposat a anar per aquesta via, d’anar construint el seu autogovern. I això efectivament entra dins del debat de la sobirania. El que jo els deia abans és que aquest debat, transcendent, és el que haurem de tenir la setmana que ve i en les properes setmanes; no és un debat que es pugui fer en calent, que s’hagi de fer avui, cada moment té els seus codis de conducta. Avui estem en un no, no hi ha marge per al pacte fiscal i la setmana que ve estarem en el debat català i en les decisions. I en les properes setmanes veurem aquestes decisions on ens han de portar. P.- ¿Entre esas decisiones que tomarán la semana que viene está encima de la mesa la convocatoria inmediata de unas elecciones anticipadas? Y ¿con qué mensaje va a ir usted a esas elecciones? ¿Iría con el mensaje de la independencia? ¿Cómo se hace esto con la Constitución vigente? Le hago una doble reflexión, una ya la he hecho y se la repito. Hay preguntas que hoy no tienen respuesta. Si va a haber elecciones en Catalunya o no en poco tiempo no se lo voy a contestar hoy. Estas decisiones y otras muchas habrá que tomarlas en los próximos días o en las próximas semanas. Hoy no es el momento de anunciarlas porque además no están tomadas. No hagan muchas especulaciones. Hay decisiones que me corresponden solamente por mis facultades como presidente catalán, y les puedo asegurar que hoy por hoy no están tomadas, están todas las decisiones abiertas. Quiero comparecer ante el Parlamento la semana que viene y con la solemnidad del Debate de Política General para poder tener un debate a fondo sobre la situación en la que nos encontramos como país, como Catalunya. hubo ruido de sables y la Guardia Civil invadió el Congreso. La Constitución se hizo en aquel contexto, pero se hizo de una manera que se podía ir releyendo, para que cuando los tiempos fueran mejores y con menos ruido, se pudieran hacer aquellas cosas que no se podían hacer en los años 70, pero han pasado más de 30 años y en vez de releerla de una forma más abierta, más amable, más en la línea de un Estado plurinacional, que en definitiva es el español, porque hay pueblos que se sienten nación y esto no lo van a cambiar con una Constitución, ni con unas declaraciones por muy alto rango que tengan. Esto no se cambia, es un sentimiento, una voluntad y un proyecto y unas raíces, y una identidad, es todo esto junto, esto no se cambia ni por una Constitución, ni por declaraciones, ni por presiones, ni metiendo miedo; no lo cambiaron ni las dictaduras eso, imagínese entonces como va a cambiar eso otras situaciones. ¿No lo quieren releer nunca en un término algo más abierto que lo que se pudo hacer hace 35 años atrás? Las constituciones se adaptan y si no se adaptan no anulan las voluntades de un pueblo, y si Catalunya en su momento, sea en los próximos meses o años, de una forma pacífica, democrática y muy mayoritaria, quiere emprender un camino y un proyecto de futuro, pues a esto no se puede poner simplemente una Constitución como un pared insalvable; esto no funciona así en ninguna parte. P.- Surt de la Moncloa amb la sensació que si la legislatura s’ha esgotat i creu que la paraula a banda del Parlament potser se li havia de donar als ciutadans, amb eleccions o referèndum? És evident que una vegada arribes a la conclusió que el pacte fiscal no té recorregut de negociació, que és el que se m’ha dit d’una manera molt clara, és evident que aquest és un punt d’inflexió significatiu en l’actual legislatura, no es pot dir el contrari, perquè seria atemptar contra el sentit comú. Si el gran tema era aquest, conjuntament amb la reactivació de l’economia i la protecció de l’estat del benestar, si el pacte fiscal, que a més a més va lligat amb aquests dos temes, no té recorregut de negociació. Insisteixo, no és que jo pretengués avui que em diguessin que sí a tot, jo avui volia saber si hi hauria recorregut o no per parlar-ne. Però és que no hi ha recorregut, no hi ha camí, i és evident que això és un punt d’inflexió transcendent en la legislatura. Com s’ha de resoldre? Els demano que no facin especulacions perquè es poden equivocar. Se’n poden fer moltes, però crec que és més normal, i més correcte en una democràcia madura com pretén ser la catalana, que si tenim un punt d’inflexió important en la legislatura i d’aquí a tres dies tenim un Debat de Política General que és el més solemne de l’any, el més normal és que aquest debat el fem al Parlament de Catalunya. I així serà. P.- Ha dicho que a parte de este no rotundo al pacto fiscal, en la reunión se ha planteado la hipótesis de una revisión del sistema de financiación de las autonomías en el horizonte del 2013. Quisiera preguntarle si ha sido un ofrecimiento al margen, unos puntos suspensivos, en minúsculas, o bien tenían una formalidad mayor. ¿Qué tamaño tenía? En segundo lugar, quería preguntarle si usted le ha transmitido al presidente español alguna opinión respecto a la carta del rey. No le puedo dibujar la dimensión del ofrecimiento sobre la revisión del sistema de financiación, porque ha salido durante la conversación y creo que como hoy el señor Rajoy estaba en una posición de que lo que yo planteaba era no, sin matices, él mismo ha tenido el impulso de decir: esto es no, pero de lo demás, en su momento, tendremos que hablar. Pero es que de revisar el sistema de financiación el año que viene hay que hablar seguro, porque de acuerdo con la ley, finalizan los 5 años de vigencia del sistema anterior. Por lo tanto, sí o sí toca hablar de esto. Creo que a estas alturas, tengo la sensación que no tienen nada programado. Creo que es más un ofrecimiento sin mayor contenido y que va en la línea tradicional que es que cada vez que hay que revisar el sistema de financiación nos ponemos todas las CCAA del régimen común, que somos 15, nos ponemos a hablar con el Gobierno y a partir de ahí se hace un sistema que más o menos recoge el anterior y alguna cosa más que, a veces es en positivo y, a veces, no tanto. Esa es la película de 30 años de sistemas de financiación autonómicos. Nosotros pretendíamos des de Cataluña superar eso. Y nos ofrecen lo de siempre. Por eso al principio les he dicho que cuando nos ofrezcan lo de siempre, nosotros que somos gente educada, iremos a la mesa, nos sentaremos, escucharemos, sabremos que aquello no resuelve los problemas de fondo de Catalunya y punto y final. Pero eso no cambia nada sustancial ni fundamental, que es lo que se pretendía y se pretende des de Catalunya. La carta del rey no ha salido en la conversación, no le hemos dedicado ni 30 segundos. P.- Ha calibrado las consecuencias financieras que este discurso suyo tiene? Usted ha reconocido la vigilancia estrecha de los mercados y los socios europeos a la situación española. ¿Ha calibrado todo esto? En segundo lugar, ¿qué valoración hace usted de la carta del rey? ¿Cómo se puede avanzar dentro de la Constitución hacía más soberanía para Catalunya? Si no hay una relectura abierta de la Constitución, es evidente que dentro de la Constitución esa relectura hay que hacerla en el sentido que hemos propuesto. Por ejemplo. Yo soy de la tesis que lo que hemos propuesto como pacto fiscal no requiere un cambio de la Constitución sino de una ley que se llama la LOFCA, que es una ley que deriva de la Constitución pero que se puede hacer de una manera u otra. En ninguna parte de la Constitución dice que Catalunya no pueda tener un sistema de financiación bilateral con el Estado. Lo que sí dice es que los sistemas de financiación autonómicos tiene que incorporar una cuota de solidaridad entre los territorios. Pero que el Gobierno catalán no pueda tener la gestión de la agencia tributaria igual como tiene la gestión de la policía, eso no lo dice la Constitución. Es más, en un artículo dice que casi todo es transferible a las comunidades autónomas si se quiere, y por tanto también la Agencia Tributaria. No se puede poner la Constitución como una pared insalvable, porque en el momento en que es una pared insalvable, se hace un camino imposible. Si no se puede tocar nada en el sentido de ni releer nada, se hace un camino imposible, al final. Para algunos, para otros territorios del Estado no será así, pero para un territorio como Catalunya, que tiene aspiraciones de autogobierno reales y, además, que se siente nación, este sentimiento, voluntad, proyecto e ilusión, no lo anula un texto constitucional. Yo he calibrado perfectamente la situación en la que estamos. Tanto que creo que nos estamos comparando en general con una serenidad muy grande. Pero que el hecho de que España esté en la situación que está, que quiere decir que nos afecta a todos, ¿significa dar la espalda a una opinión pública catalana, que sale a la calle, un millón y medio de persones de forma absolutamente pacifica, sin reventar nada, y eso es una realidad que nos olvidamos de ella, le hemos de dar la espalda? Se imaginan ustedes en España una manifestación de 9 millones de personas de golpe, que es la misma proporción en España que un millón y medio en Catalunya. ¿Se imaginan ustedes eso, se le podría dar la espalda a una manifestación de 9 millones?. Pues nosotros tampoco le podemos dar la espalda porque somos el Gobierno de Catalunya y porque sabemos desde hoy que, además, nuestro proyecto de negociación del pacto fiscal no tiene recorrido. Se nos ha dicho con toda claridad. Claro que hay inestabilidad, la hay en toda Europa, pero porque haya inestabilidad nosotros no nos podemos simplemente sumergir como si no existiéramos. Las dinámicas están abiertas en todas partes, y de debates de soberanía en plena inestabilidad los hay en toda Europa. ¿O no es un debate de soberanía si el BCE tiene que hacer de banco controlador de todo el sistema financiero europeo o no? Y si al final unos se acogen a un fondo y otros a otros también hay problemas de soberanía y no por eso se toman decisiones inmediatas. Problemas de soberanía hay en todo el debate europeo de forma constante. Si no hubiera debates de soberanía, tendríamos los Estados Unidos de Europa en este momento, que es lo que necesitamos. Todo el mundo lo sabe. Pero precisamente porque hay debates de soberanía no tenemos los Estados Unidos de Europa. Y Catalunya en estas condiciones no puede estar callada ni subyugada ni inerte. Tiene que estar viva, y lo está. Mi valoración sobre la carta del rey la expresó el portavoz de nuestro gobierno hace pocos días. No nos sentimos aludidos. Si se habla de quimeras, también podría ser una quimera pretender que, sin tocar nada de la Constitución ni releerla en ningún sentido, se pueda aspirar a encajar bien Catalunya en el conjunto del Estado. Y no lo digo por respuesta a la carta del rey, pero no nos sentimos aludidos. Nosotros no hemos planteado ninguna quimera, hemos planteado un proyecto que se llama pacto fiscal, votado por el 70% del Parlament, lo hemos defendido dónde lo hemos tenido que defender. Es un proyecto que está ampliamente consensuado en la sociedad catalana, votantes de todos los partidos aspiran a eso. Eso no puede ser nunca una quimera, y como entendemos que el rey no puede aludir a eso como una quimera, no nos damos por aludidos. P.- Sobre aquest debat serè i constructiu que demana de cara al debat de política general, Vostè va dir la setmana passada que el cop de porta d’Espanya o l’Estat al pacte fiscal obria la porta a la llibertat de Catalunya. M’agradaria saber si aquest debat l’encararà cap a aquest camí, ja que avui ni tan sols ha esmentat l’expressió d’estructures d’estat? No, avui no ho he fet. No perquè em vulgui contradir amb res, ho he fet per una raó molt senzilla que crec que vostès ja han entès. Avui no he vingut a donar resposta sobre el que farem a Catalunya. He vingut a fer un balanç sobre la transcendència, el que significa que el pacte fiscal no tingui recorregut, una vegada això és evident i oficialment comunicat i a parlar-los que això no és un tema menor. El que hagi de dir en aquest sentit ho diré la setmana que ve al Parlament i en les properes setmanes en general. Crec que amb això ja li responc, no el que a vostè li agradaria sentir, però és el que m’he autoimposat de dir com a màxim, per respecte al Parlament. A mi em va escollir el Parlament com a president i, si estiguéssim a quatre mesos del Debat de Política General, potser ho faria diferent, però a tres dies, crec que he d’anar al Parlament de Catalunya a explicar les coses tal i com les veig, com les veu el Govern i, a partir d’aquí, escoltar els partits i prendre decisions. P.- En aquest procés de reflexió que ara comença, té previst reunir-se amb l’empresariat català que li ha demanat que esgotés fins al final la via pacte fiscal? A tothom que a Catalunya m’ha demanat que exhauríssim la via del pacte fiscal els he fet cas, i després he fet cas d’un mandat del Parlament de Catalunya i d’un programa propi amb el qual vam guanyar les eleccions, que es deia pacte fiscal. Els he fet cas perquè he arribat fins al final. Jo avui m’he trobat un dic de contenció, una paret, en aquest tema, en altres no. En altres, el president Rajoy ha estat més obert a parlar-ne, a trobar solucions, però en aquest tema la resposta ha estat clara. Per tant, tots aquells que em demanaven que fes el màxim esforç possible pel pacte fiscal, està fet. No hi ha ningú més amunt del president del Govern espanyol, no puc recórrer a cap altra instància. I com que no hi ha ningú més amunt, i ell em diu el que em diu i, a més, que al costat seu partits polítics espanyols em donaran la mateixa resposta, doncs no perdrem mesos ni anys en una cosa que ja se sap que no té recorregut ni té futur per la via del pacte. Per tant, és evident que, a partir d’aquí, hem de prendre decisions. Però vull deixar molt clar que tota aquella gent que ens ha demanat que féssim el màxim esforç en aquesta línia, l’hem fet fins al darrer segon del darrer minut, però la resposta és la que és. Jo el que no puc fer és substituir el senyor Rajoy, en el sentit que m’hauria agradat que la resposta fos una altra. Per mi aquest no és un dia que jo em sentit gaire content ni satisfet, perquè sé que tot això afegeix problemàtiques de molts tipus, però com que també tinc molta confiança en el que jo represento, que no és un partit polític sinó en aquest moment un país, el poble de Catalunya, estic segur que el poble de Catalunya davant d’aquesta evidència, d’aquesta negativa, sabrà trobar respostes que converteixin aquesta decepció que avui pot ser una decepció, en una il·lusió i un compromís de futur. P.- ¿El presidente del Gobierno le ha dicho si ese no rotundo ha sido un no consensuado con Rubalcaba? No me lo ha dicho, tampoco se lo he preguntado. Lo he entendido así y, además, si escucha las declaraciones de Rubalcaba, es muy evidente que la respuesta es no también por parte del partido socialista, digan lo que digan los socialistas catalanes. La respuesta del socialismo español, es que no, con la misma intensidad que lo dice el PP o el presidente del Gobierno. P. ¿Usted cree que el impacto que va tener este no rotundo en la ciudadanía de Catalunya será el de frenar o dar más alas a esa ola de apoyo a la independencia? Una ciencia exacta en este sentido no se la puedo avanzar. Mi intuición es que, si toda aquella gente que en Catalunya se quiere ir cargando de razones para ver si hay posibilidades de avanzar en ese marco estatal y constitucional, y después van viendo que no las hay, no porque no haya voluntad de negociar por nuestra parte, que la hay, sino porque en la otra parte de la mesa no hay ni ganas ni interés de abrir una negociación, pues esta gente que en Catalunya hacen esta apuesta de irse cargando de razón, probablemente no sé a qué conclusión final llegarán, pero sí llegarán a una: que Catalunya, como consecuencia de estos nos, no se puede quedar sin proyecto. Eso seguro. Y por tanto, Catalunya en estos próximos tiempos tiene que formular un proyecto lo más mayoritario posible, pero tiene que formular un proyecto. Porque las evidencias son que en ese marco estatal es muy difícil avanzar, de acuerdo con las aspiraciones catalanas. Tuvimos el Estatut de 2006, que acabó cepillado y vilipendiado en el TC. Eso no fue neutral, eso dejó un pósito en Catalunya de una gran incomprensión y de una cierta frustración y seguramente de un cierto cabreo,. Y aquel poso sigue existiendo, pero ahora es mayor. Y si cualquier intento que haga Catalunya de grandes temas que le preocupan al final no tienen recorrido, ni siquiera de negociación, pues incluso la gente que en este sentido era más reticente le puede hacer de cambiar de opinión y puede decir: lo único que no puedo permitir como ciudadano catalán, piense así o de otra manera, es que Catalunya se quede sin proyecto, porque quedarse sin proyecto quiere decir quedarse sin futuro, a la deriva, sin rumbo. Esto es lo único que no nos podemos permitir. P.- ¿Tratará de que los puentes dentro del Estado español o con el Estado español estén abiertos? Ha sido usted insistente en que no va a tomar una decisión en caliente pero supongo que hay una horquilla dentro de la que usted se mueve y me gustaría saber si la apuesta por la ruptura de España desborda esa horquilla. Tomemos las decisión que tomemos en los próximos días, meses o semanas creo que no hay que plantearlo en términos de ruptura, porque ruptura es como si hubiera un aislamiento total, y tomemos la decisión que tomemos la vamos a tomar dentro de un marco europeo, y dentro de un marco de una moneda en la cual nosotros creemos, que es el euro. Nosotros no nos vamos a separar de ahí. Y en ese marco europeo y del euro ahora está España entera, está también Catalunya. Y haga lo que haga Catalunya seguirá estando ahí. Y eso no son rupturas, eso son evoluciones, en todo caso. Las cosas, las sociedades evolucionan, e incluso las estructuras de los estados evolucionan. Y solamente mirando el mapa europeo usted verá que ha sido así en los últimos 15 o 20 años. El mapa europeo de hoy no tiene nada que ver con el mapa europeo del año 1190. Y eso no han significado rupturas, al revés. En muchas ocasiones han significado integraciones, ampliaciones, siempre con dialogo, con un espíritu de buscar lo mejor para todos, etc. No sé qué decisión se tomará del todo, incluso por parte de la sociedad catalana y de los partidos catalanes, pero yo como consejo general, al menos en Catalunya lo explicaré así, creo que no hay que hablar en términos de ruptura total, porque creo que eso seria un error, porque dentro del marco europeo no hay rupturas totales, no las puede haber, no tienen sentido. P.- Ha fet una reflexió respecte a la creació d’un nou estat? Ell li ha demanat explicacions per la reclamació que ha fet? tota la raó. És una cosa que no me la pot demanar. Per tant, ell mateix ha estat molt correcte en aquest sentit, dient que no li corresponia a ell demanar el que nosaltres havíem de fer, les decisions que havíem de prendre. Ell com a president del Govern espanyol té sentit que demani ja que estem en una situació molt complicada en el conjunt de l’Estat i que intentem tots ajudar de manera que la situació de l’Estat es tranquil·litzi i es normalitzi. Això li correspon demanar-ho com a president del Govern. Nosaltres, en aquests darrers mesos, mentre ell ha governat en moltíssimes ocasions hem tingut aquesta mentalitat i amb el Govern anterior també. Hem tingut més aquesta mentalitat que els partits estatals quan estan a l’oposició i pensen només a canviar el Govern espanyol. Això no li he dit, però els ho dic a vostès. P.- Usted decía que no se estaba planteando en términos de ruptura y decía que no piensa separarse ahí, de la UE. ¿Me podría concretar si quieren separase de España? Ya sé que el debate está en términos de ruptura, de separación y este es el debate ordinario, pero entienda que yo tengo que utilizar un lenguaje un poco distinto. Tome la decisión que tome Catalunya en los próximos días, semanas o meses, cualquier decisión tiene que ser en el marco que nosotros somos un país y una sociedad que queremos estar en Europa y en el euro. Después lo que eso significa de relación con España ya se verá. Eso es lo que está abierto y no voy a contestar hoy. En cualquier caso, se tome la decisión que se tome, sea cual sea el proyecto catalán, yo defenderé que tiene que ser un proyecto europeo, de Unión europea y de euro. P.- ¿El presidente del Gobierno les ha planteado que no convocará elecciones? Usted está plateando que no va a romper con Europa pero sí con España. ¿Lo ve compatible? Usted ha interpretado eso de mis palabras? Vuelve a insistir en romper. Usted me pregunta por romper y yo le digo que no está en mi vocabulario y usted vuelve a decirlo... Así es muy difícil entenderse porqué responda lo que le responda usted va a poner romper. Y así es muy difícil responder. Qué quiere que le diga? Nosotros no queremos... Cuando nosotros hablamos de proyectos de futuro de Catalunya no hablamos de rupturas; hablamos en algunas ocasiones de estructuras de estado, en otras ocasiones de estado propio, pero no hablamos de rupturas totales; que esto conlleva si se llega a hacer algún tipo de replanteamiento general de todo? Pues es evidente, esto no es cualquier cosa, es un tema de grandísima envergadura. Pero nosotros cuando hacemos eso y lo explicamos lo situamos en ese marco europeo, siempre. Nosotros no nos hemos vuelto locos! Que queramos ser catalanes y también en el futuro no quiere decir que nos hayamos vuelto locos y, por lo tanto, nuestro marco natural es la UE, el euro. Y queremos seguir estando ahí. Y, por tanto, las decisiones que nosotros tomemos deben estar dentro de ese marco. Y eso significa que no se puede mover nada en el futuro? Si resulta que todas las cosas que planteamos es no, no y no, pues se moverán las cosas, eso es seguro. Seguro que de la reflexión que se haga en Catalunya saldrá un proyecto distinto del que hemos tenido hasta ahora, esto es evidente. No podemos seguir muchos años más igual que los últimos 30, porque eso sería darse con la cabeza en la misma pared. Eso no puede ser y ya se entiende, no? Ahora, cualquier planteamiento que no lo situamos en términos de ruptura en dónde Catalunya evolucione hacia algo distinto de lo que ha sido hasta ahora tiene que ser en ese marco europeo y en ese marco del euro y, por lo tanto, dentro de un escenario de normalidad y tranquilidad democrática y, por supuesto pacífica. No nos lo planteamos de otra forma porque no nos hemos vuelto locos. Lo de las elecciones no me lo ha planteado en esos términos en absoluto. Con eso ha sido muy respetuoso, como tienen que ser, y yo le he dicho que obviamente esto nos ponía en una situación complicada y que tendríamos que tomar decisiones en los próximos tiempos. Él explícitamente me ha dicho que no me iba a preguntar cuáles, porque no le correspondía. P.- Respecte a aquesta nova etapa que està dibuixant de relacions entre Catalunya i l’Estat cap la possibilitat que els passos a donar vulnerin en algun moment l’actual marc juridicopolític, com la hisenda pròpia sense acord... Creu que hem d’estar preparats des del seu punt de vista per a passos que puguin vulnerar l’ordenament? La meva reflexió aniria una mica diferent, perquè la pregunta explícita que vostè formula jo no li puc contestar avui. Això es veurà quan hi hagi aquests plantejaments de futur el màxim de consensuats possibles dintre de la societat catalana. L’única cosa que li puc contestar és que no hi ha cap marc legal que pugui fer-se servir eternament per anul·lar la voluntat majoritària, democràtica i pacífica d’un poble. Òbviament, a les dictadures o a les semidictadures o d’altre tipus de règims es pot anul·lar la voluntat d’un poble de moltes maneres: manu militari, per la força de les armes, per la força de la violència, per la força de l’aniquilació de la identitat. Nosaltres com a catalans ja ho hem viscut en carn pròpia al llarg de la història tot això i no una vegada, sinó una i dues i tres i moltes... Ja sabem què vol dir això. Però ara Espanya no és un estat dictatorial, ni és un estat on imperi la violència, és un estat on impera la llei, l’estat de dret, forma part de l’euro, i en aquestes condicions, si el poble de Catalunya d’una manera molt majoritària, pacífica i democràtica decideix evolucionar cap a un futur diferent arribarà un moment en què no es podrà posar un text legal que digui que anul·len els sentiments que tenim, la voluntat i el projecte. Això no es pot escriure en un text legal. S’hauria de fer complir per altres vies que en una Espanya democràtica no són possibles i en una Espanya europea tampoc són possibles. Aquesta és la grandesa de la democràcia, que es pot parlar de tot i es pot plantejar tot sense por que actuïn de forma violenta i per això tots hem treballat perquè Espanya també fos una democràcia, que és el que és. Mirin el que està passant al Regne Unit, que estan donant una lliçó en majúscules del que és la democràcia. Els escocesos diuen que volen fer un referèndum i jo no sé si fer un referèndum està dintre de les normes britàniques, però el Govern britànic diu que si vol fer un referèndum per decidir el seu futur cal negociar les condicions. Això és el que s’ha de fer en democràcia. Jo he de pressuposar que si Espanya és una democràcia – com és i tots hi hem contribuït-, la norma, la llei –per molt important que sigui- no podrà ser sempre la paret que anul·la el sentiment, la voluntat i el projecte, això serà impossible. Amb això no li responc directament, però ja s’entén què volem dir amb això.